I’m hearing everything differently…and I don’t know why. I had a realization the other day, regarding my hearing. Now, I’ve always considered myself tone-deaf – maybe because I just can’t sing, have a hard time telling the differences in notes, and am horrible about understanding volume – but who knows. Is there some test I can take to see if I’m really tone deaf? Well, anywhooo, whatever happened on Monday changed my life forever. I hear everything differently. People’s voices are clearer, sound prettier, and are more distinguished – from family members, friends, and movies/music. It is very odd. Maybe after finishing the Lymph-Flo cleanse (Monday was my last day) – my lymphatic system has drained and opened up to allow a whole new sense experience – HEARING! Whatever it is, I’m fine with it! And maybe I’ll be better at singing in the long run…but probably not. As I make this journey of enhancing my health and wellness (an ongoing one, for a lifetime), I’m attempting to expand my hobbies and really find things that I love to do. I know I love to cook, read, write, and capture beauty – so I’m starting with these. Capturing beauty, for me, is the best. I love taking pictures and do it often. However, since I got an iPhone last Spring, I rarely use my nice DSLR camera…which is stupid. So I’ve decided to start taking it with me, at least once a week, and capturing some beautiful moments. And now I’ll share them here! 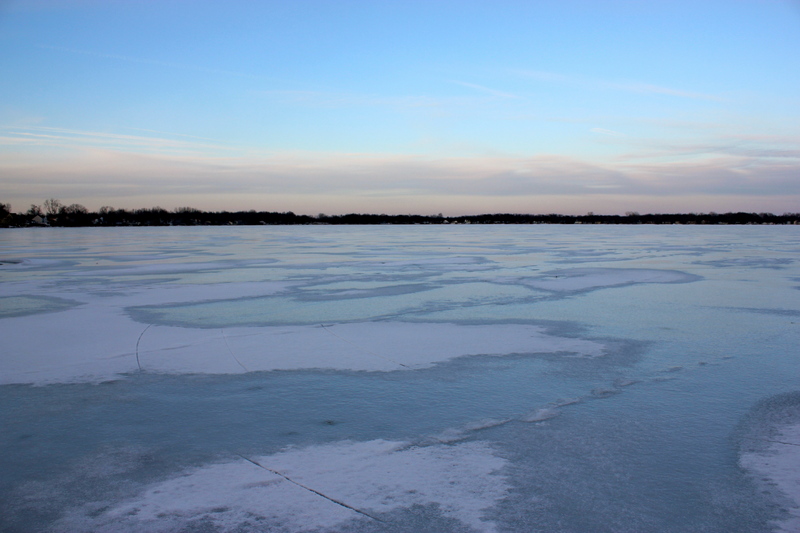 So, as my last post discussed – I walked across a frozen lake on Saturday…and I did it again on Monday. Well, I didn’t walk all the way across, I merely walked out 30 yards, planted myself on the ice, and listened to music, opened my soul, and enjoyed the beautiful cold air. After doing yoga last night, I broke my cleansing diet by enjoying a Bombshell, at University Roadhouse, with my girl Ellyn. Basically, it is like 1,000 calories in one dessert, but simply amazing. It is a ball of moose tracks ice cream, covered with Oreo crumbles, and dipped in a chocolate shell. So delicious and horrible for you – and full of GMOs. So, this is a once a year treat and honestly, although it was great tasting, and I don’t feel too bad this morning – I probably won’t be eating anything like it again. I’ll stick with my whole food treats – like raw cheesecakes, almond butter bars, or Justin’s chocolate peanut butter cups (all organic, all fair trade). Tomorrow starts my position as the volunteer Tweeter for PFC Cooking Classes and I can’t wait! Also, I’ll be going to my future home this weekend, and hopefully take the next step in purchasing this house! It is perfect – will share more once it is mine. ← Spring is right around the corner…I think!